A 2.5kW wind turbine and 1.7kW photovoltaic (solar) panels supply a good share of the electricity needed to run the Centre and our Recycling Team’s electric vehicle. Passive solar design – the building has large south facing windows, triple glazing and exceptionally good insulation to allow it to be heated directly by the sun’s energy while minimising heat loss. 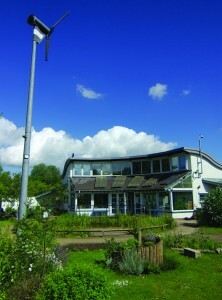 Rainwater used to be collected and purified for use at the Centre until 2012. We connected to the water mains that summer because the water supply had become too unreliable. Solar-thermal panel heats the water and additional room heating comes from a smoke-free wood burning stove. Modern compost toilets reduce the need for water by thousands of litres, produce nutrient-rich compost for trees in the nature reserve, and provide a popular talking point. The building has a ‘living roof’, covered with low growing Sedum acre, a drought resistant succulent plant. The leaves turn red in dry conditions and green again when it rains. The blanket of plants helps to insulate the building, reducing heating requirements. The roof also minimises water run-off, contributes to the local oxygen balance and provides a habitat for a wide range of insects. A lot of lessons can be learnt from the building. Some of its green features have performed well over the years and others not so. The staff are happy to talk about the experiences of working with this pioneer building. 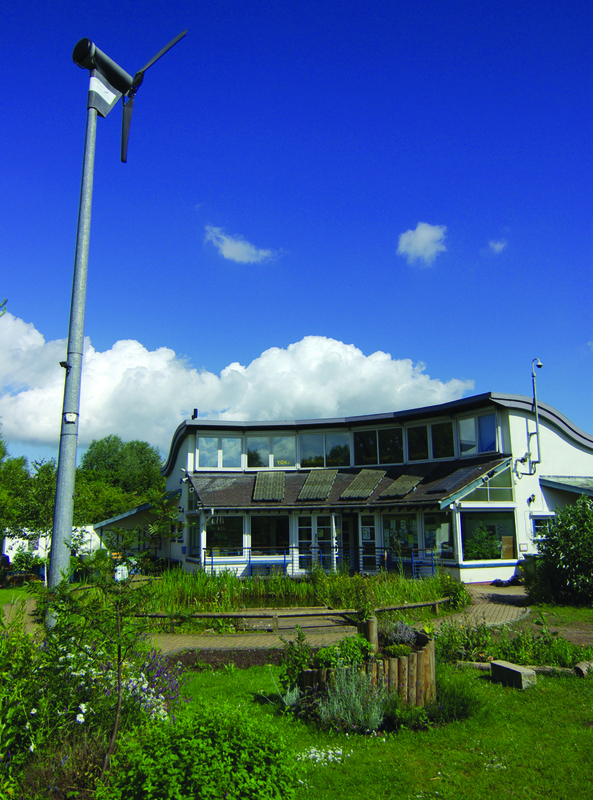 At the time of its opening it was one of the first community buildings combining all those green features under one roof, and the wind turbine was the first one of its scale to be connected to the national grid.